Light and airy, relaxed but stylish, Butterfly Cottage is a great place to get away from the city! 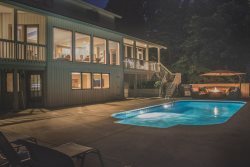 There is a huge, fenced back yard with a sparkling private pool that is open from roughly May 15 - September 15 every year, a big lawn for games and sports, and a large deck from which to view it all. Best of all, the Pier Street Beach in Lakeside is exactly one mile from the house so you can walk, bike or drive to the beach as there is a tiny bit of roadside parking allowed. The house has an open, flowing layout and big windows that lets the sunlight in. There’s a cozy fireplace in the living room and a den where you can kick back and watch TV. The well-equipped kitchen has a pass-through to the dining room, which comfortably seats eight. There are three bedrooms on the upper level, beginning with the master bedroom suite that features a king bed. The master bathroom has a deep soaking tub and two additional bedrooms that share a full bathroom. There’s another full bathroom and bedroom with queen bed on the main level that is great for those who can't do a lot of stairs. There is also a large finished family room in the basement. There are plenty of other sources of adventure and entertainment close by, including the Four Winds Casino, great restaurants, art galleries, and interesting stores to explore. Butterfly House is in a peaceful country location on the east side of Red Arrow Highway but still close to the lake, with woods across the road and neighbors a discrete distance away. All the amenities and opportunities of Harbor country are right here so come and enjoy some pool time at this cute house! One mile from Lake Michigan beach!